"In the evening, the sound of birds coming home to nest can be heard in the dense tropical foliage." 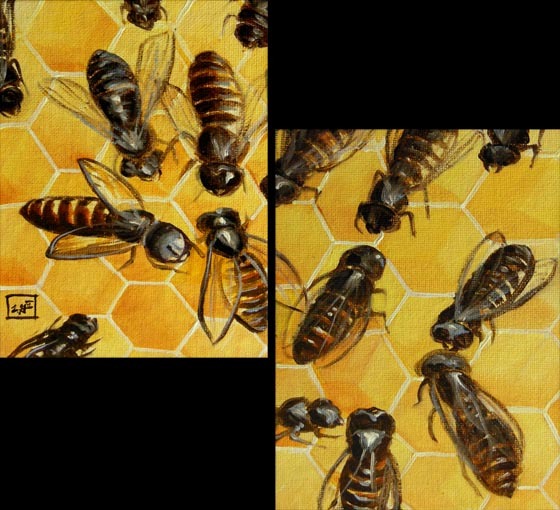 "Bees are the most useful insects to mankind." 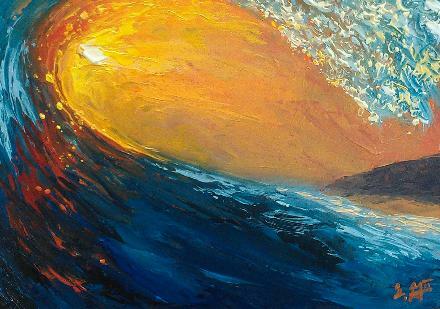 "The Evening's Splendor" - 16" x 24" OIL ON canvas, *Coming soon! 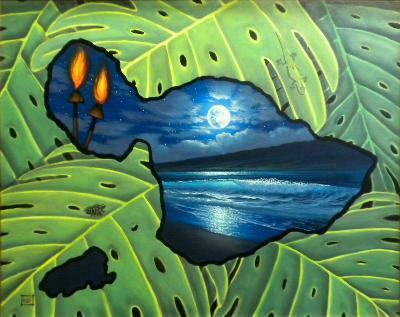 New moonlight Ko Olina/Ihilani painting. 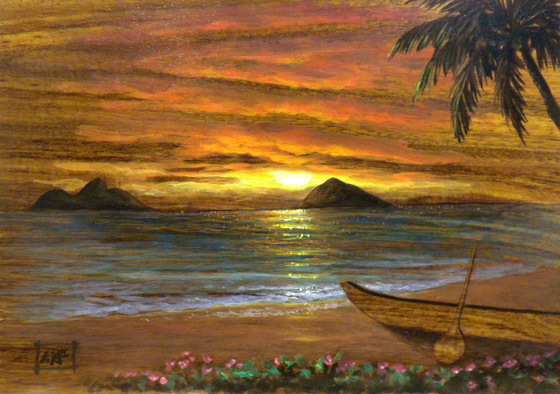 "Enjoy the evening's splendor over and over again at the Kohola lagoon in Ko Olina." "Time to give thanks and praise to the Lord for the goodness of a beautiful day." "Winners of the day find ways to look at the good side of things instead of dwelling on the bad." 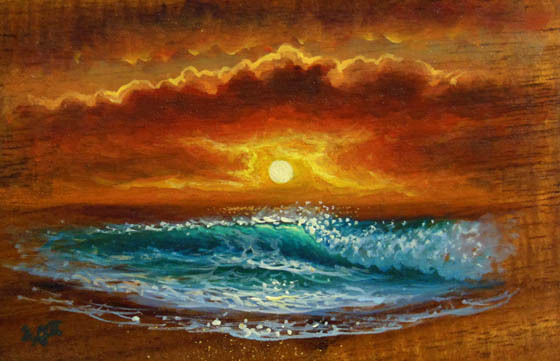 "Waves lap up on the shore whispering words of love and passion." 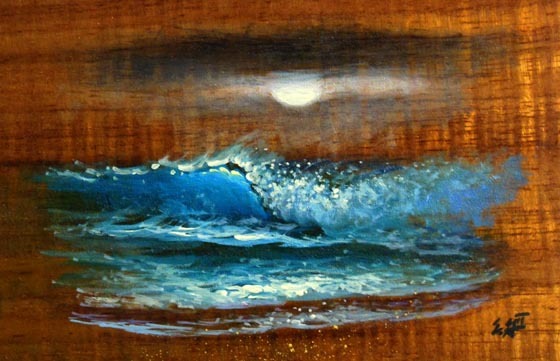 "Surfers new to Hawaii are often taught the hard way to respect the ocean and its power." 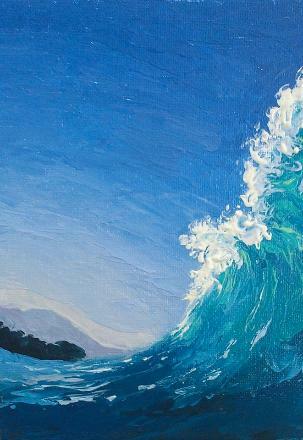 "Early to rise makes it easy to have the choice waves before the lineup gets crowded." "As the sun goes down, it's time to ride one all the way to the beach." "It's all about perfect positioning when dropping in on juicy waves." 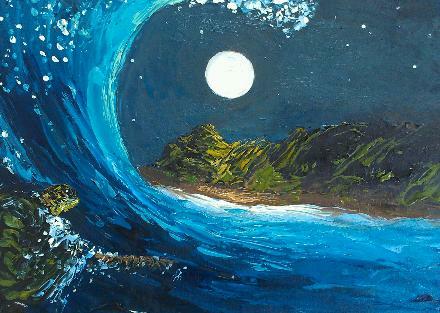 "Risk and reward are found when surfing on special nights." "It's all about the tube when riding waves in the best spots." "Dropping in behind the lip makes for going deeper and deeper in the tube possible." 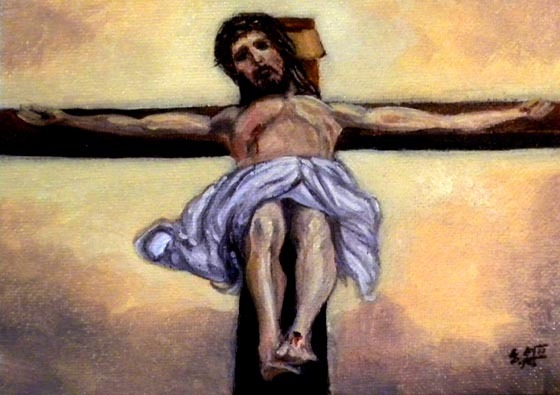 "This is just a study of a future crucifixion painting I'd like to do." 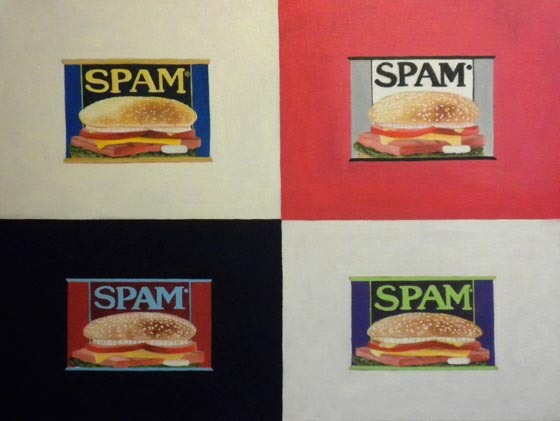 "My love for spam inspired this. 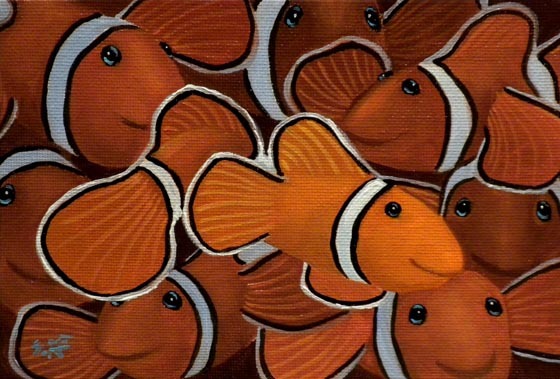 It's an homage to Andy Warhol, who popularized and made pop art collectable. Warhol did Campbell Soup cans in lithography as well as other popular brand names." "Many loving hands make for a blessed life." 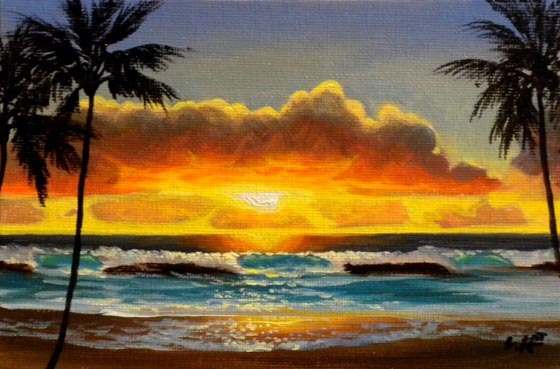 "Sunset in Ko Olina" - 5x7 original oil on canvas board. 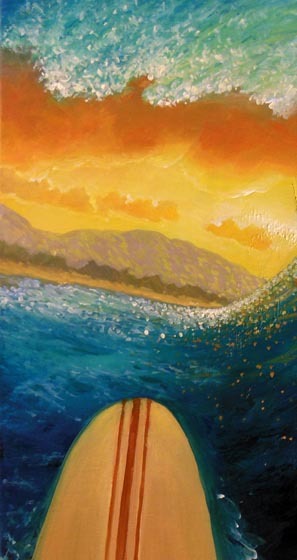 "My first omilu painting will have me doing more in the future as a series. 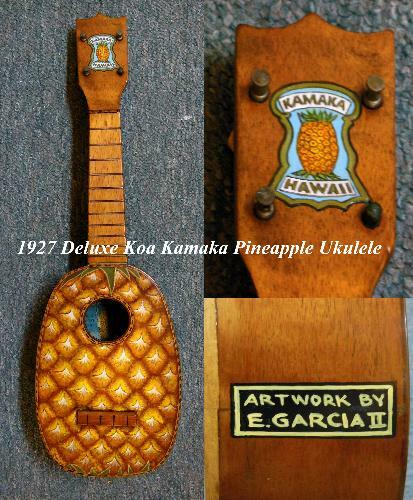 For the fisherman or diver in your life." Check out my new video slide show series on YouTube. 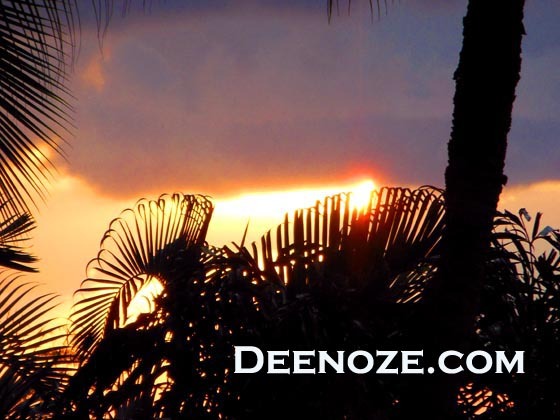 Locate us as Deenoze1. See link below to see the Making of Red Scorpion. 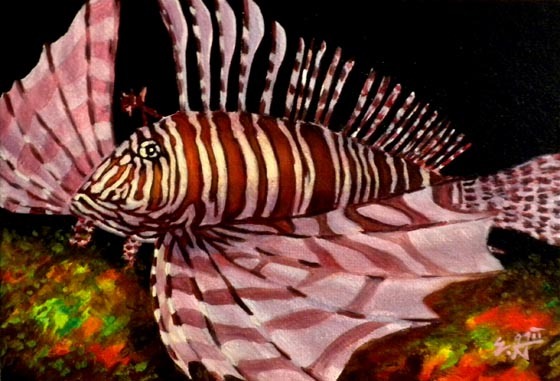 "Beautiful to look at and painful to touch, this lion fish peacocks along the bottom of the ocean knowing full well that nothing will bother it." 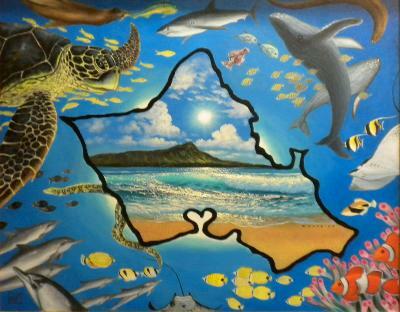 "For those who have lived in Kailua, even for a short time, have a special place in their heart for it always." 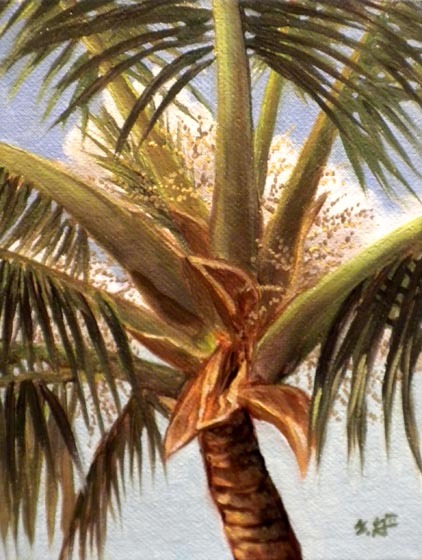 "Sunny days are especially nice under the shade of a coconut tree." 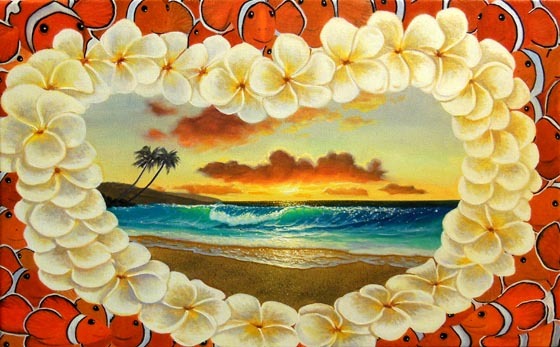 "Hawaiians treasured sea shells for their jewel like qualities in fishing lures, jewelry, tools and food." 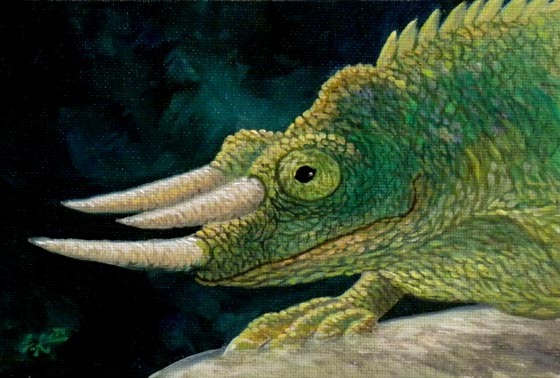 "Waiting in Gold & Tan" - 5x7 original oil on canvas board. 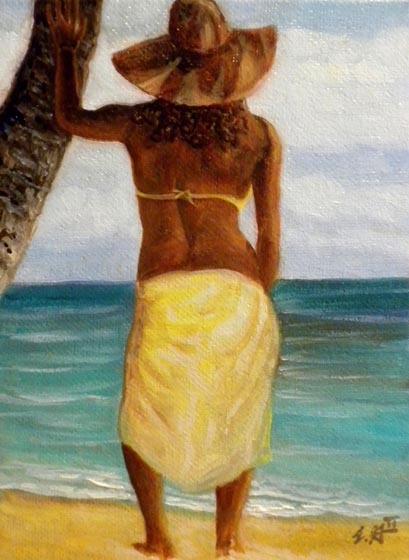 "Waiting in anticipation for love beneath the shade of a coconut palm." 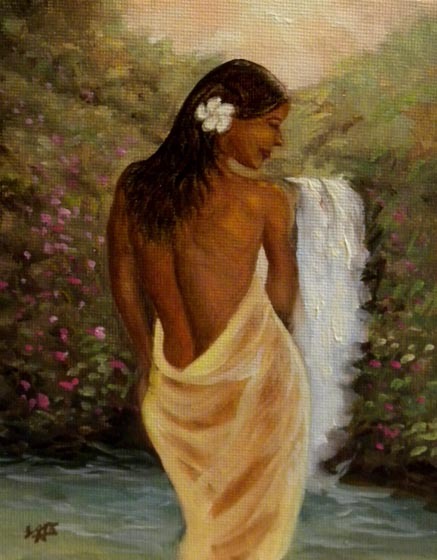 "Bathing beneath a waterfall keeps this beauty fresh and clean." 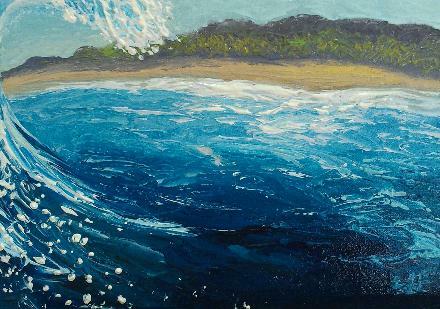 "Blue Rings and Dangerous Things" - 12 x 48 original oil on canvas. 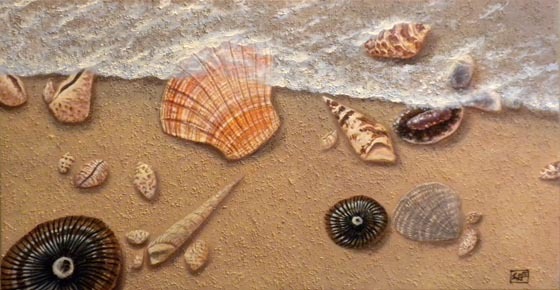 To be published in Giclee on canvas. Please inquire. 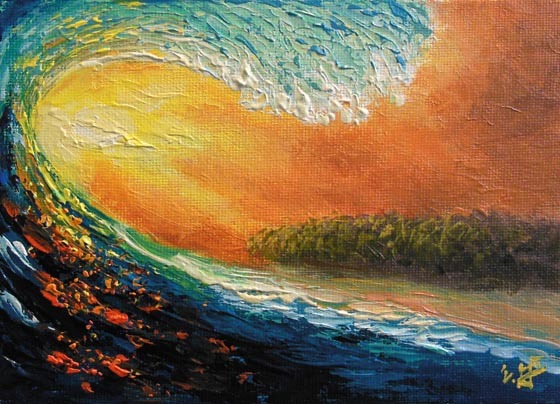 "Bright and Lively" - 16x16 original oil on canvas. 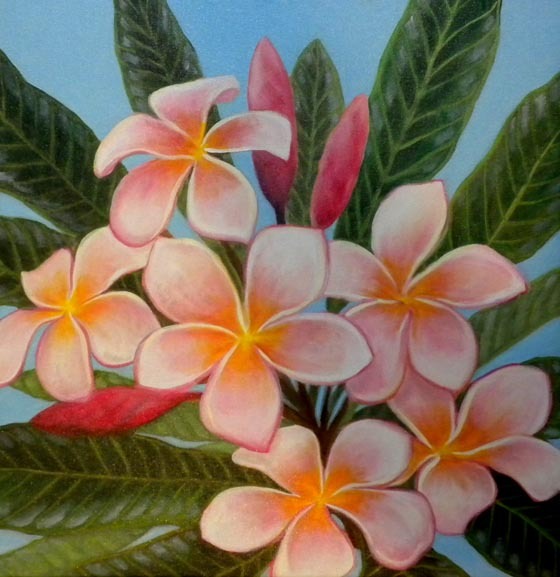 "Flowers always brighten up a room with color and scent." 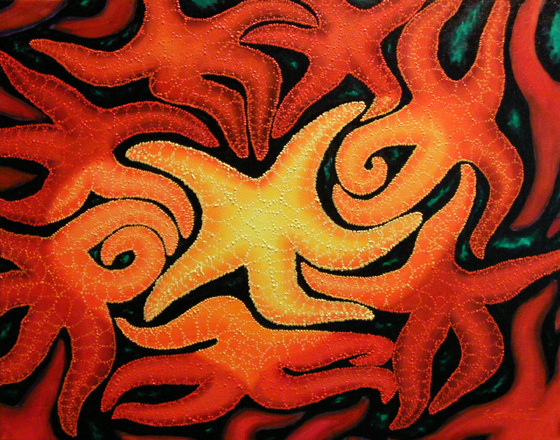 "Stars and Spots" - 9x12 original oil on canvas. "Some believe that when all is said and done, those in hell will be looking at heaven wishing they were there." 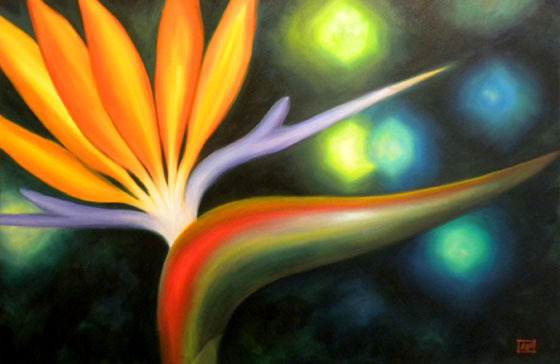 Punk rock bird of paradise shine in the bright lights. 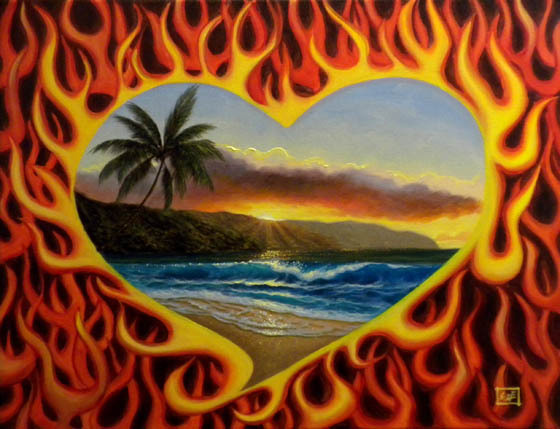 "Flame of Desire" - 22x28 Original oil on canvas. 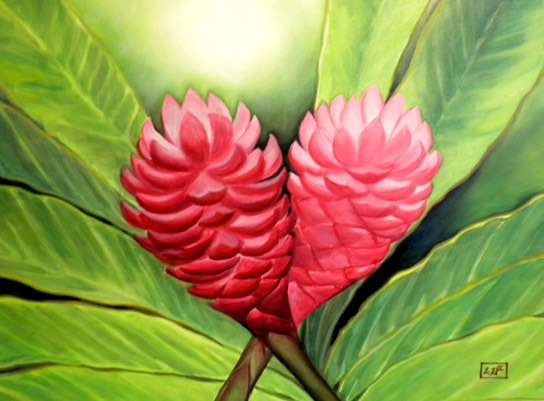 My second ginger painting features a pink and red torch ginger forming a heart as they embrace. 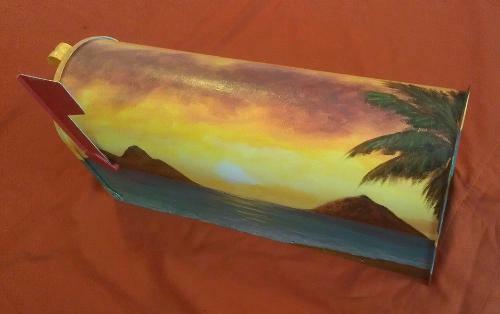 This was my donation to this years Habilitat Luau 2010. 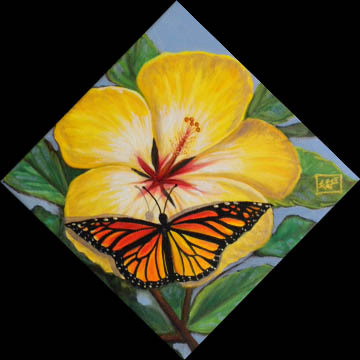 A monarch butterfly sits upon a bright yellow and red hibiscus. 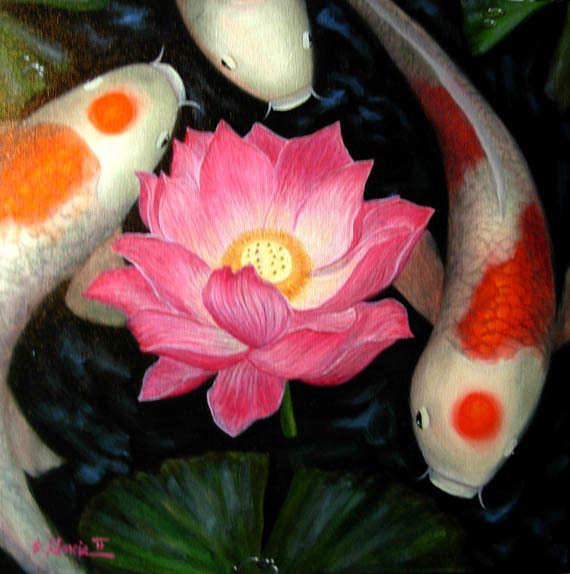 "Caught in the Moment" - 10x10 Original oil on canvas, In the Raw Series. 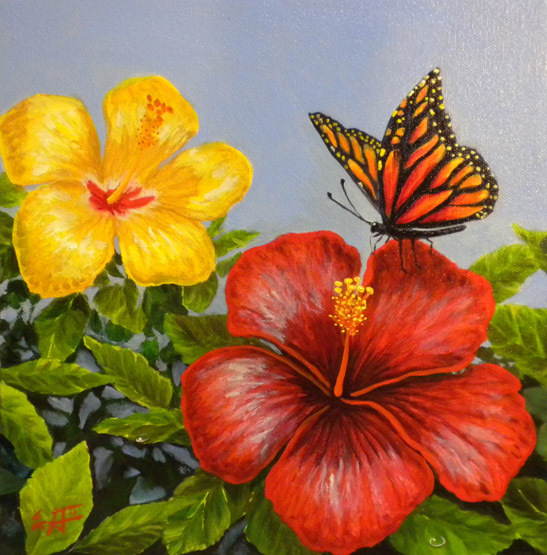 A moment captured as a monarch butterfly rests upon a red hibiscus. 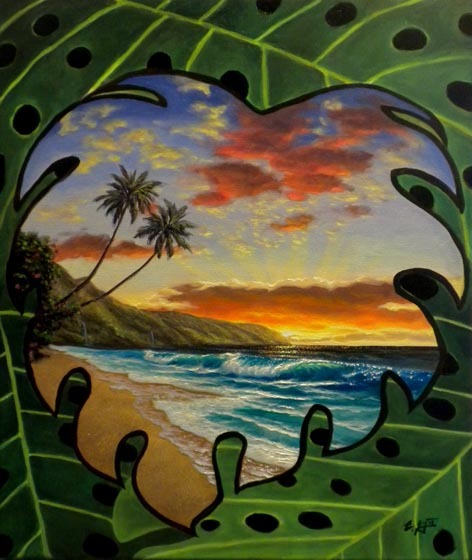 "Maui - The Valley Isle" - collaborative series by Walfrido & Edgardo Garcia II. Available in Ltd. 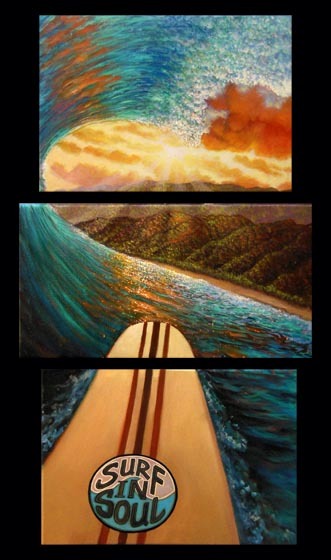 Edition Giclee sizes 30x40, 24x30, and 16x20 (inches). Please inquire. 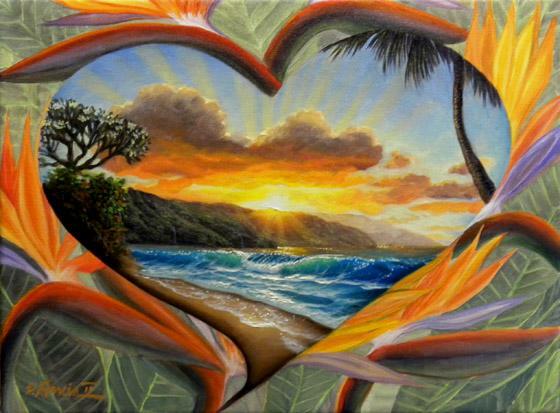 "Lush in light and life is Maui." 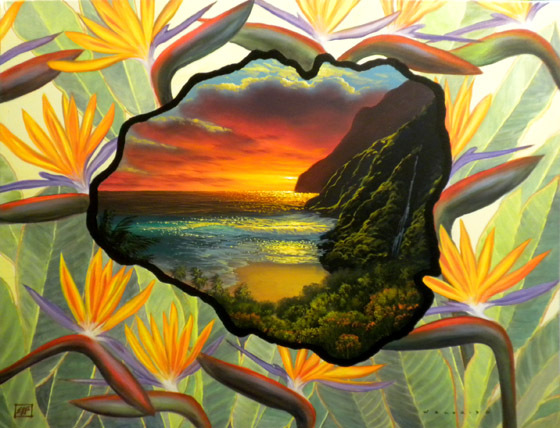 "Kauai - the Garden Isle" - collaborative series by Walfrido & Edgardo Garcia II. Available in Ltd. 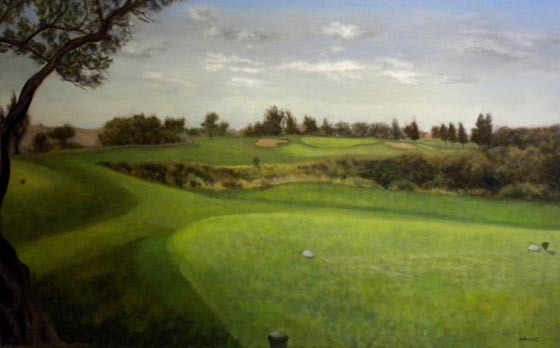 Edition Giclee sizes 30x40, 24x30, and 16x20 (inches). The Garden Isle is always lush, wet and green. 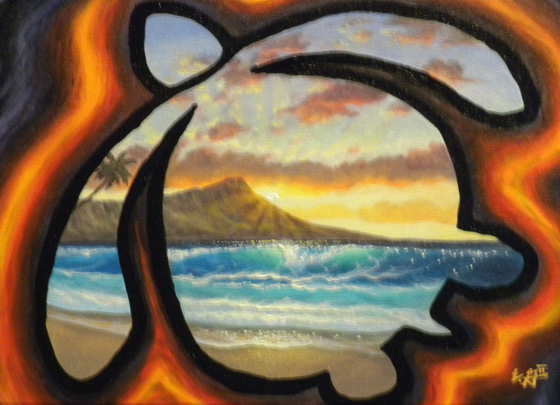 "Big Island of Hawaii" - Collaborative series by Walfrido and Edgardo Garcia II. Available in Ltd. 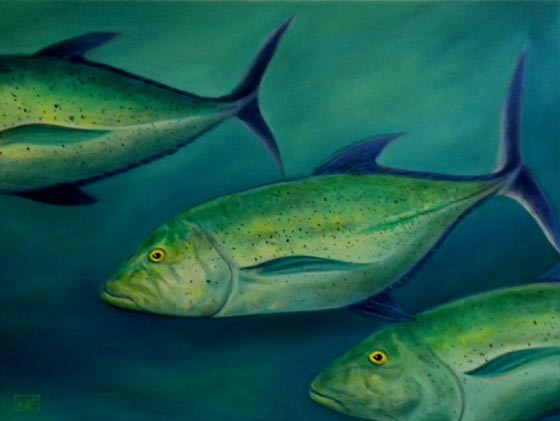 Edition Giclee sizes 30x40, 24x30, and 16x20. Please inquire. 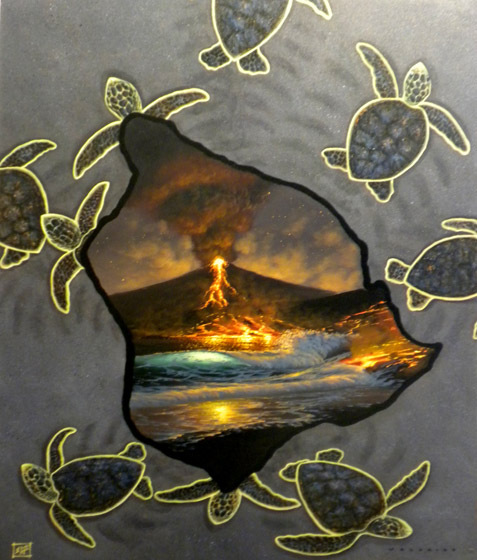 Birth of an island and the birth of baby Honu are lively events. "With hope, faith, friendship and love, you can have a full happy life." 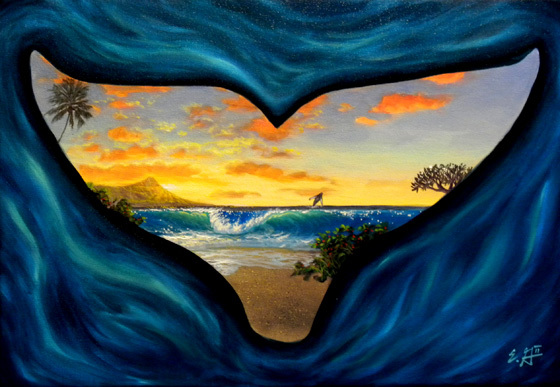 "My first Dreamscape whale tail. 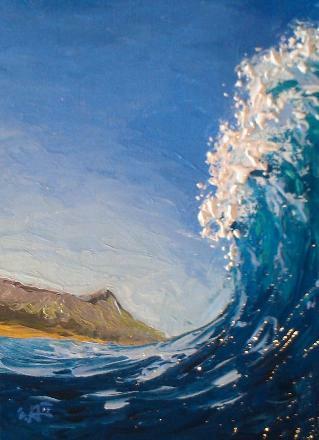 The scene is Diamondhead in the distance with a humpback whale breaching." 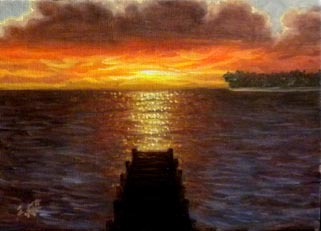 "Where the Light Leads" - 8x10 Original oil. 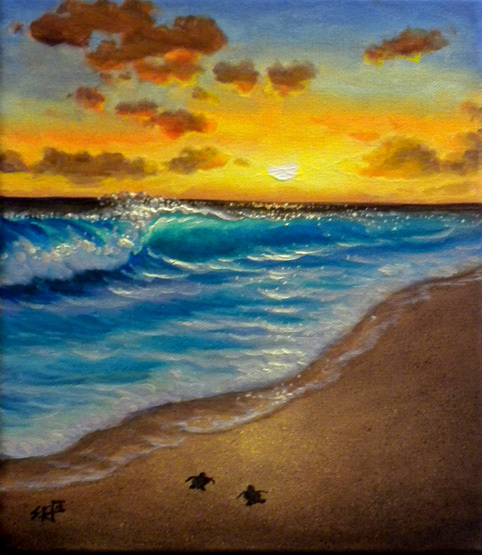 "Baby turtles awakening to the coming of Light." "This is the first of my Motion Picture Film series. 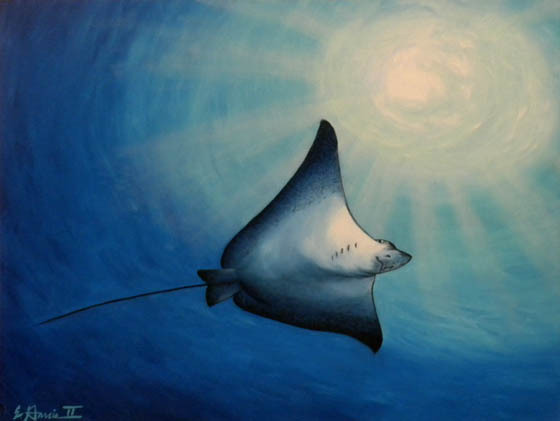 It is meant to capture a Honu in flight in the ocean." 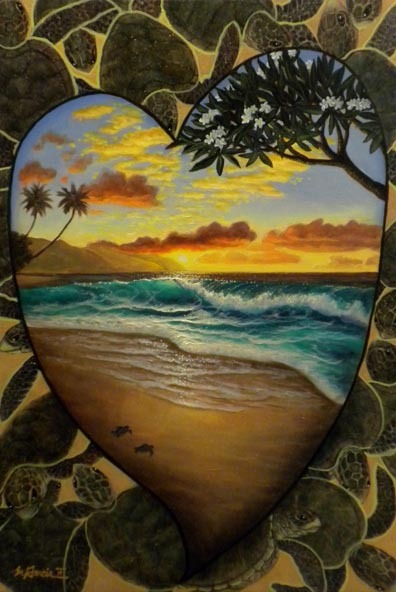 This unfinished piece has 2 baby turtles on the beach in the finished version as well as plumeria flowers on the tree branch. 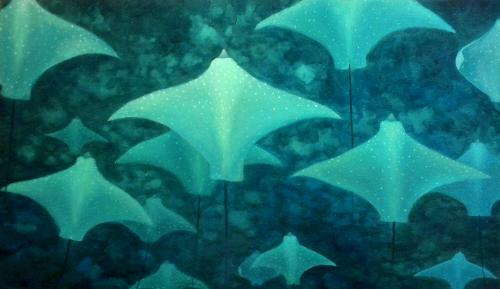 "Path of Enlightenment" - 24x72 Original oil on gallery wrap canvas. "This is my latest door sized pieces. 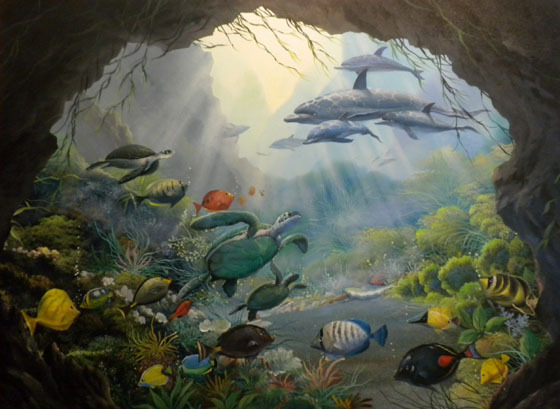 Put this on a hallway wall and create the illusion of another world dimensional door. " 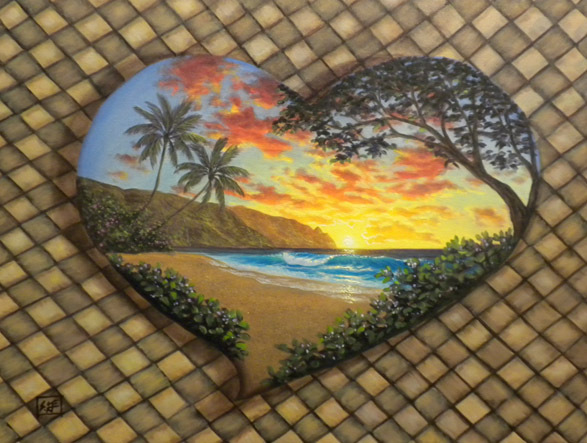 "Woven with love, this dreamscape is inspired by island life." 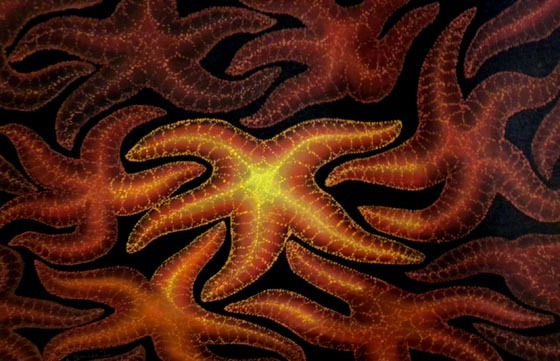 "A menagerie of life live in harmony in the sea." 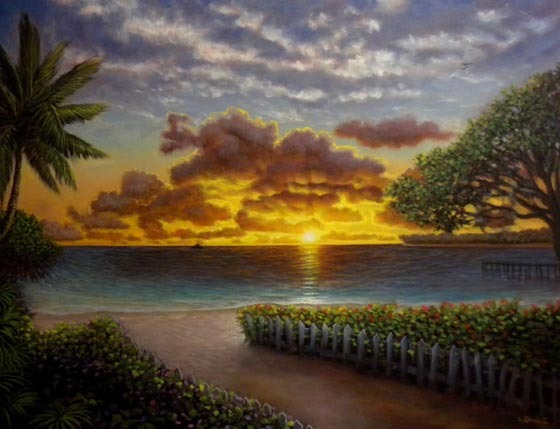 "Relive the magic with the intense colors of the setting sun. " 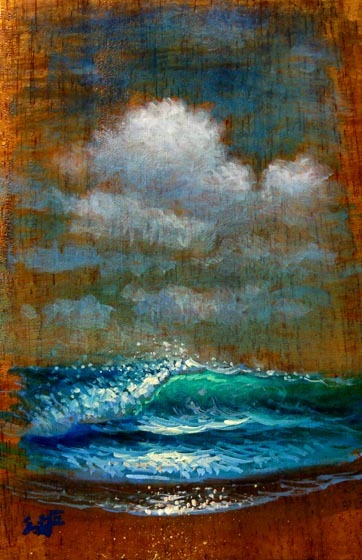 "Morning Paddle" - 9x12 Original oil on Koa panel. 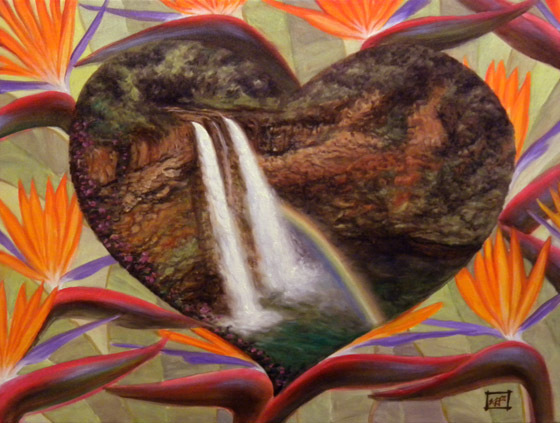 "Overpouring of Love" - Original oil on canvas 16x20. "Wailua falls on Kauai comes alive after heavy rains. " 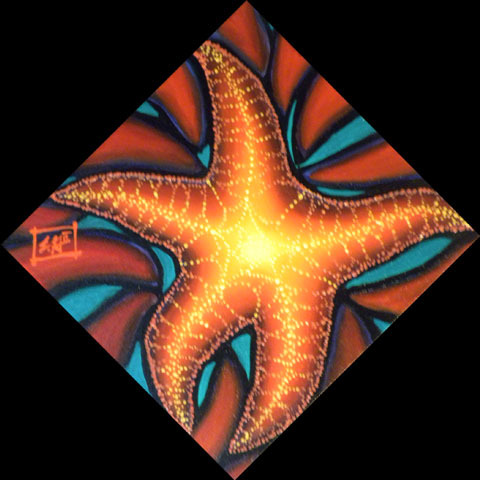 Available at Artist Gallery of Kauai/Evolve Love in Hanalei, Kauai. 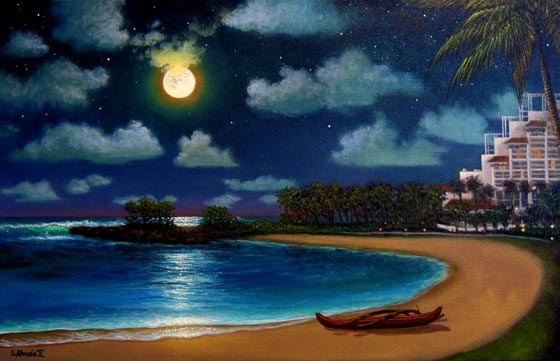 "This is one of the first dreamscapes I've done. 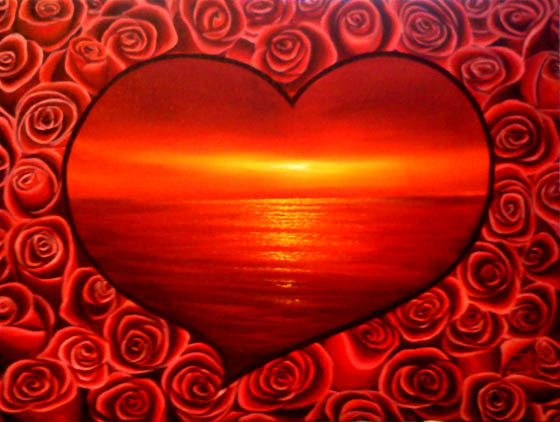 My intention is to lighten up the subject matter and add a bit of whimsical romance. " 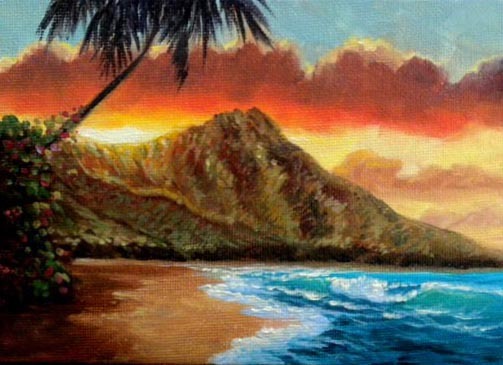 "Lava flows created the Hawaiian Islands and this surrounds the view of Diamondhead Crater." 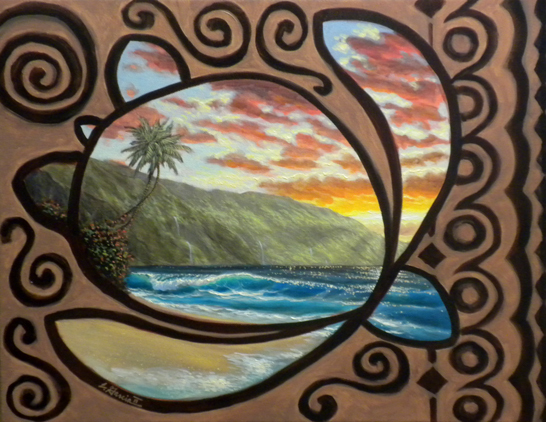 "I used various motifs to surround the Honu window like the circle of life, ferns, waves and the sun and moon. 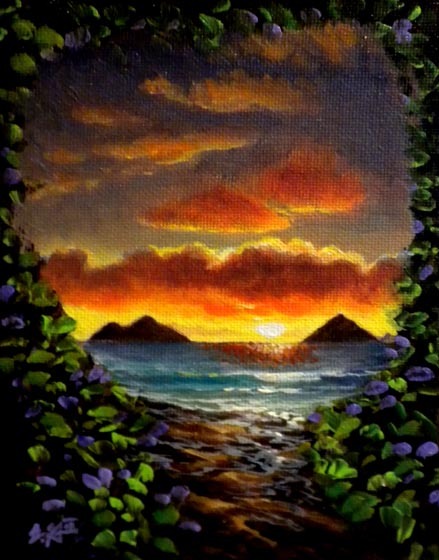 The window reveals a NaPali sunset seascape." 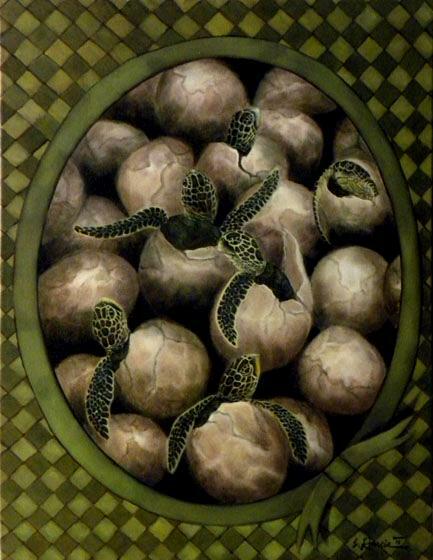 This is a tapa basket weave dreamscape with baby turtles hatching. All baby turtles within the same nest hatch within 24 hours of each other. "The monstera plant is a unique leaf that grows huge with holes in it. 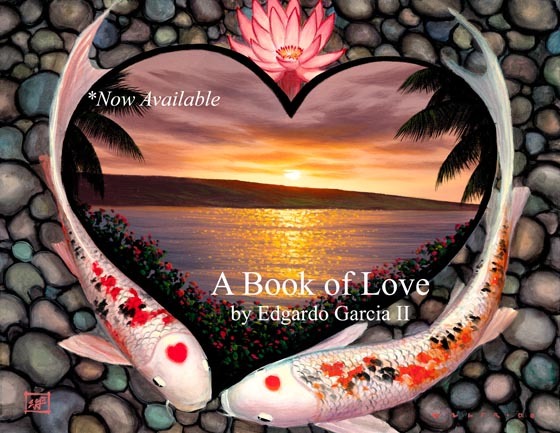 I used its heart shape to make the window into a heavenly dimension." 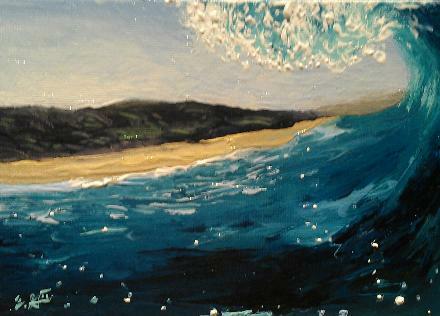 "Na Pali Dream" - 8x10 Original oil on canvas. Not available. 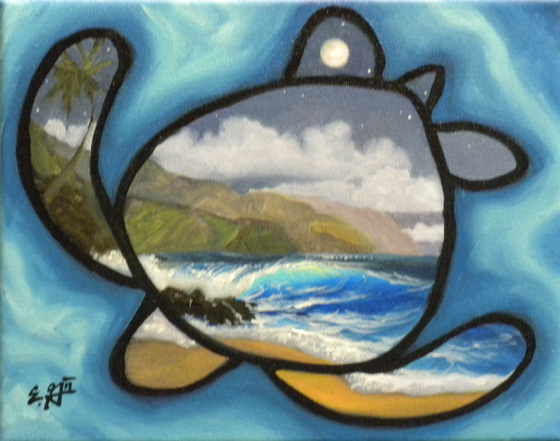 "This Honu window is surrounded by turquoise water and reveals a Na Pali coast seascape." 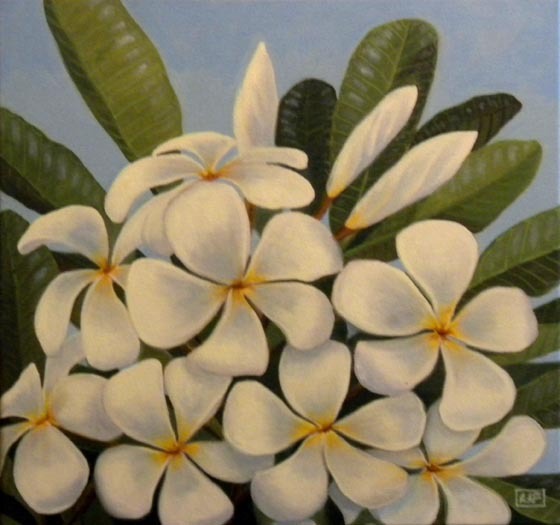 "The Big Island is very tumultuous in nature with volcanoes and the occasional tsunami. 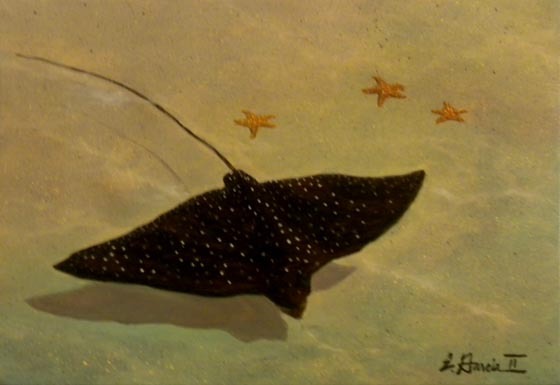 The shark can represent danger but also power and strength."